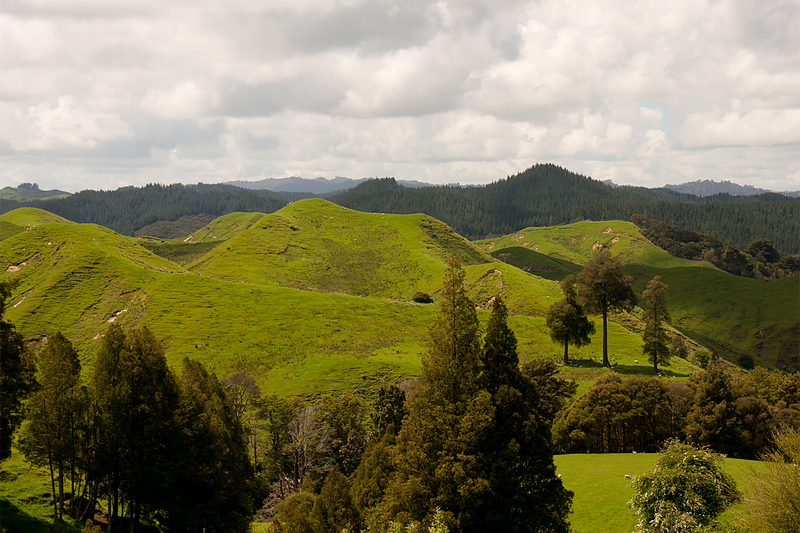 The difference between constant rain and relatively normal weather in New Zealand is just a few miles and a few hundred metres of climbing. Or, in a very close, but parallel universe, the difference between constant rain and normal weather is being an extremely lucky Swiss / German pair of cycle tourists. Who’d only got wet twice along the whole west coast. How they managed this is a bit of a mystery. And even their luck wobbled a bit when they met me. I went back to the hostel, defeated. And just checking in were Roli and Christian. They were soaked, too, but this was apparently such an unusual experience for them that they were raring to go the next morning. Rain or no rain, wind or no wind. 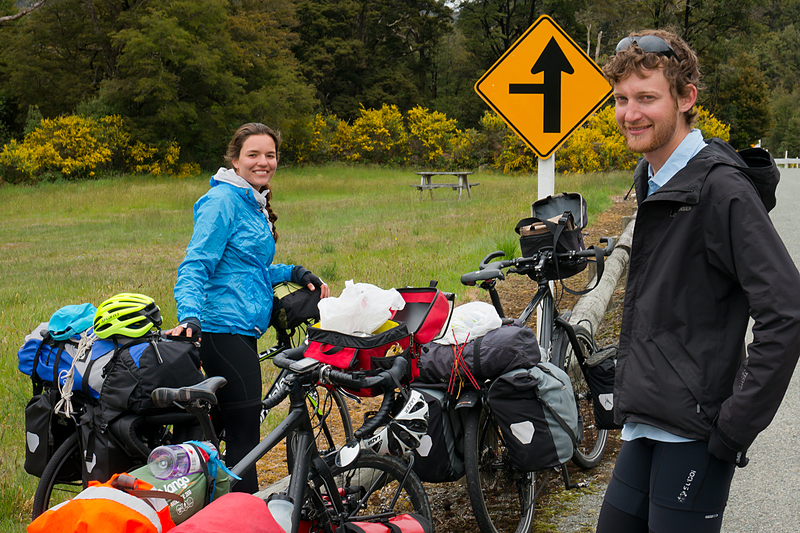 They were making the 125km run to Haast, regardless. Then they were going over the pass. 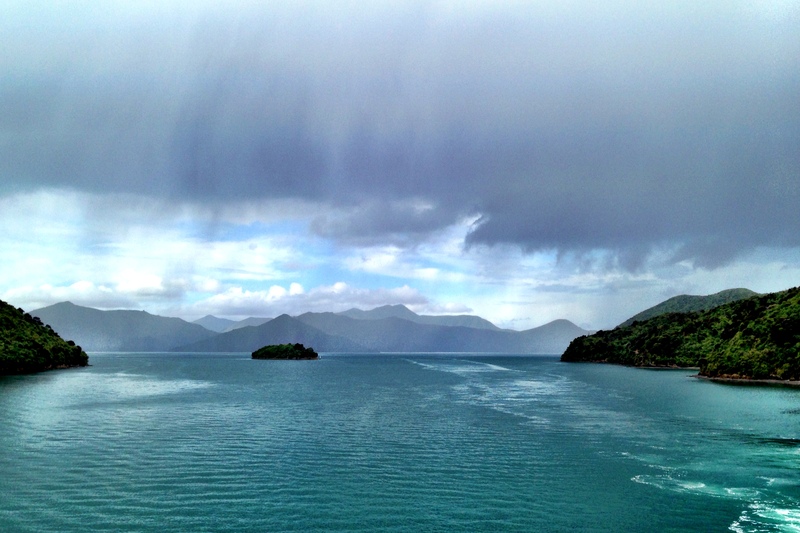 Then they were going to Wanaka, then Queenstown. And nothing was going to stop them. They are relentless. And, as a result, it’s been just a little tiring riding with them. You might notice that the picture above is taken in sunshine. This was a remarkable change of fortune in the afternoon of the long ride to Haast. The morning had been notable for a weather forecast which had suggested sunny spells, and weather which had delivered a monstrous deluge just as we were out of range of any shelter and entering the wilderness. This picture marked the point where my luck with the weather began to change; clearly, speaking German is the key to making the sun come out in New Zealand. The Wilderness. 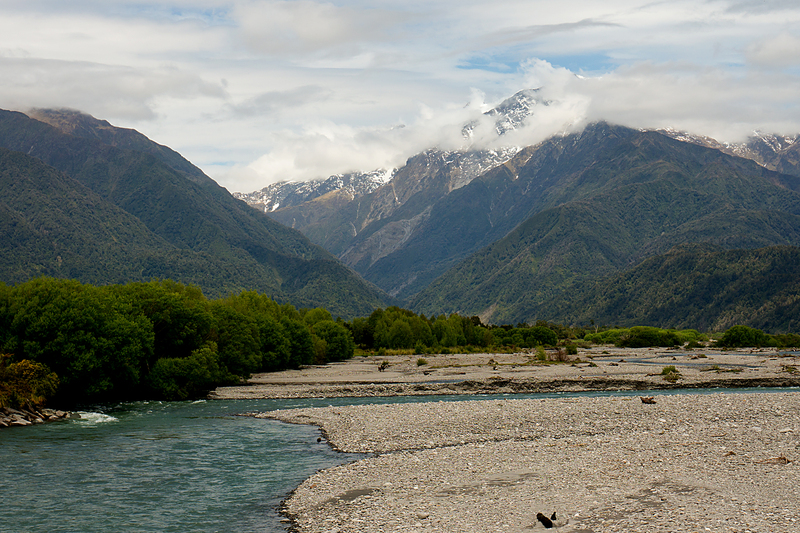 There’s nothing between Fox Glacier and Wanaka. 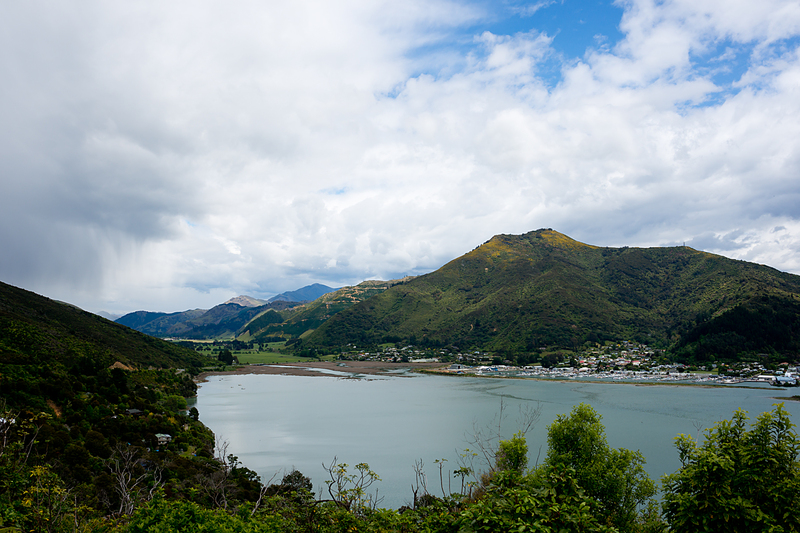 In around 250km, there is one village (Haast), one ‘Tourist Centre’ / campsite / petrol station (Makarora), and that’s it. Nothing else. No mobile signal. Virtually no shops. Virtually no people. Nothing. Except some stunning scenery, and the pass away from the west coast, which was my best hope of staying dry for more than a couple of hours at a time. 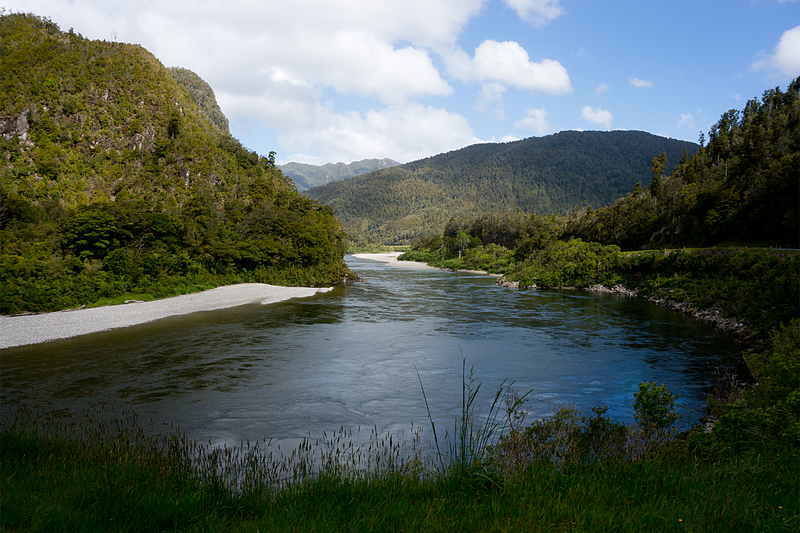 After a night in Haast village, it was off to the pass. No messing, no flapping around for hours getting ready (my usual style). Up, breakfast, pack, go. No excuses. I felt a bit like I’d just joined the army. But it got me moving, instead of moping around watching rain. And it was dry, anyway. It started raining ten minutes up the road. 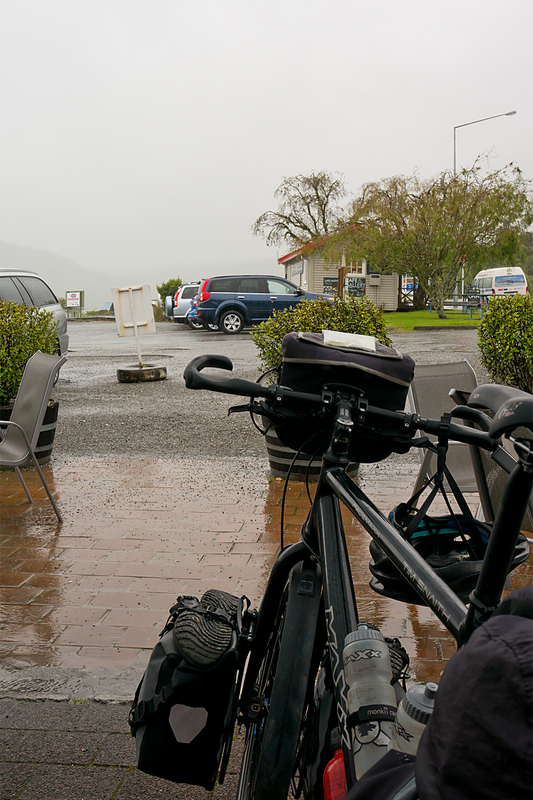 It rained for the whole ride up Haast pass. It was miserable. I might have jacked it in and gone back to Haast to cry if I’d been alone, but the relentlessness was obviously rubbing off. Three extremely damp cyclists on three sodden bicycles finally crested the top yesterday (Saturday) lunchtime. And the rain stopped. Immediately. Almost magically. 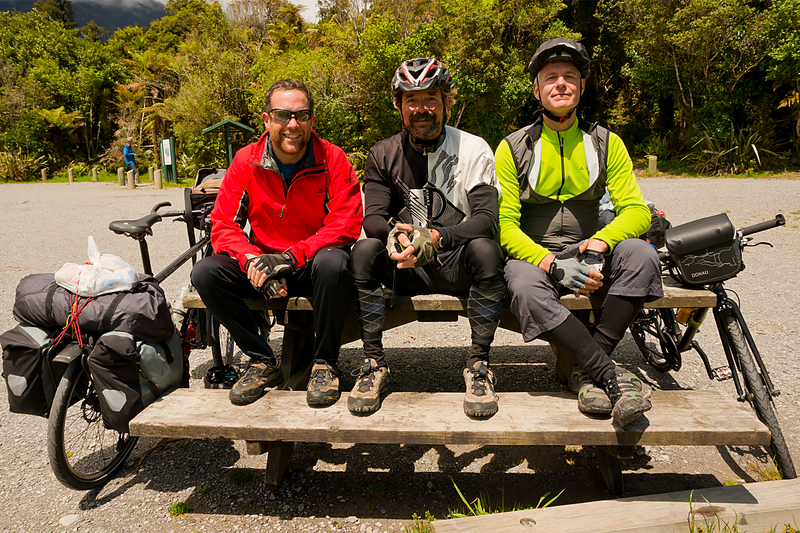 Sunshine, a long downhill, and (unbelievably) a tailwind, drove us to Makarora and dried us off at the same time. Absolutely astonishing. More astonishing, is that it hasn’t rained again since. Yet. But we’re heading in different directions tomorrow, and I can’t be sure that the Teutonic rain whisperers will still be able to keep me dry. 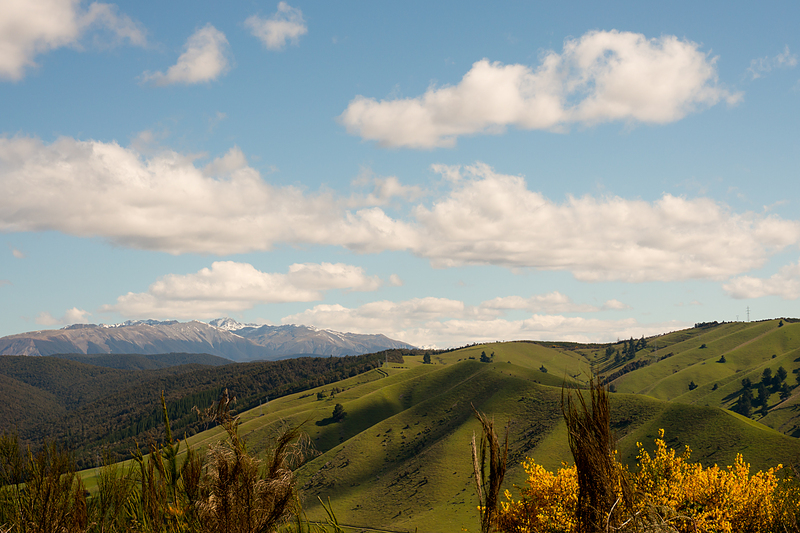 Still, today’s run down to Wanaka took place in sunshine, pretty much all the way. Not a hint of getting wet, and south island was finally showing itself off without low cloud, mist, or drizzle getting in the way. What a result! I can’t explain how good it is to think you’ve got a reasonable chance of a day’s ride without getting a soaking again. The eastern side of the mountains is much drier, so it should stay that way. You may be lucky enough not to get too many bad weather reports from me from here on. And as we go our separate ways, I wish Roli and Christian all the best. Not that they need it; they’ve already talked someone into driving their bags to Queenstown for them tomorrow. 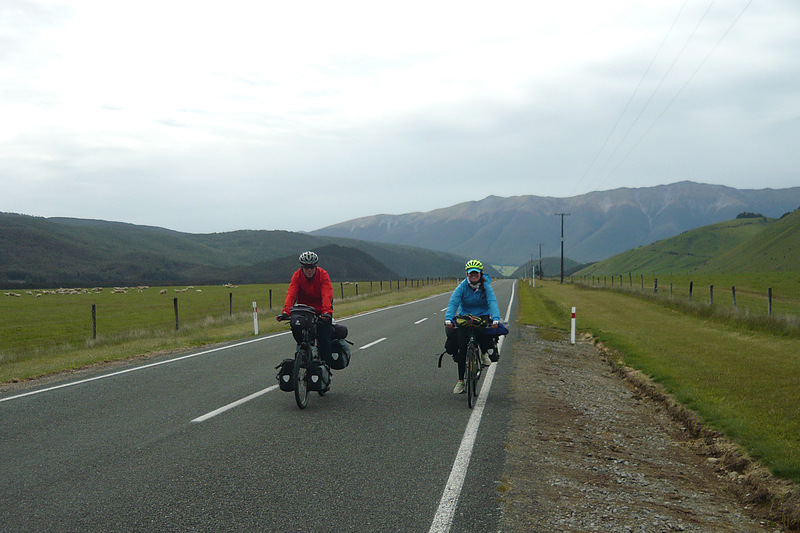 So while I wobble off in the general direction of Christchurch with a full load, they’ll be scooting gleefully along on almost weightless bikes. This might sound a little familiar. Sitting in a hostel, gazing forlornly out of the window at astonishing quantities of driving rain. And much twiddling of thumbs and pacing up and down until the skies (maybe) clear. I’m sure someone else was doing that yesterday morning (Tuesday). They may even have experienced a flicker of sympathy for any cyclists plugging away outside. I, however, was busy multi-tasking. I was out on the Beast, getting soaked to the skin and climbing hills. 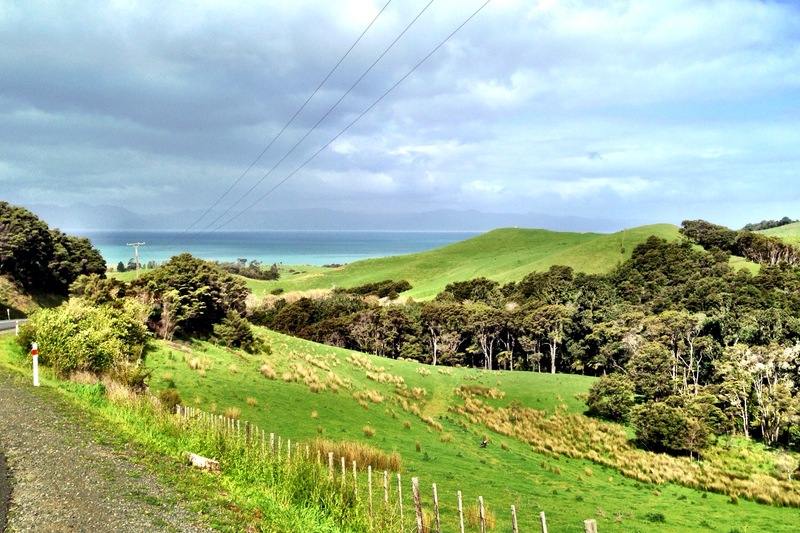 The west coast of New Zealand is proving tricky on a bike. Towns are spread unevenly and without much between, so you sometimes need to ride a short repositioning day before a longer run. 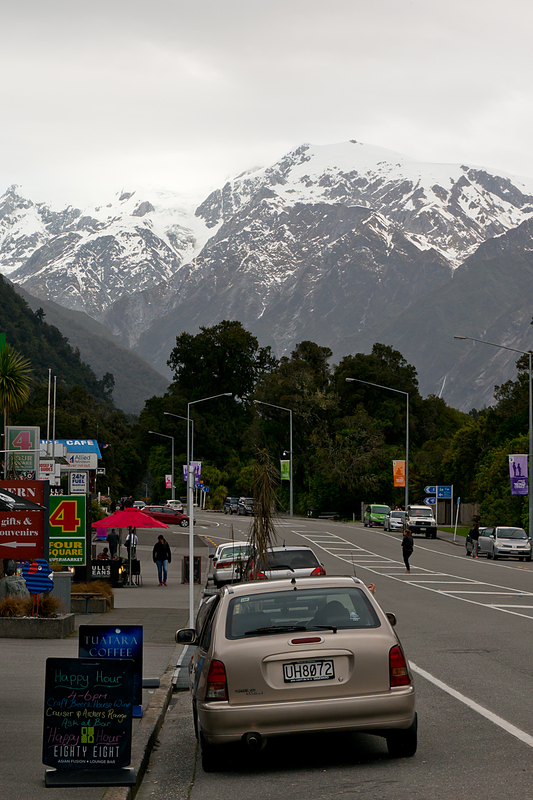 And the Southern Alps, which are a constant companion to the left of the road, have been getting bigger and bigger, which means the foothills are bigger too. Oh, and I might have mentioned that the weather is a little bit fickle. To say the least. 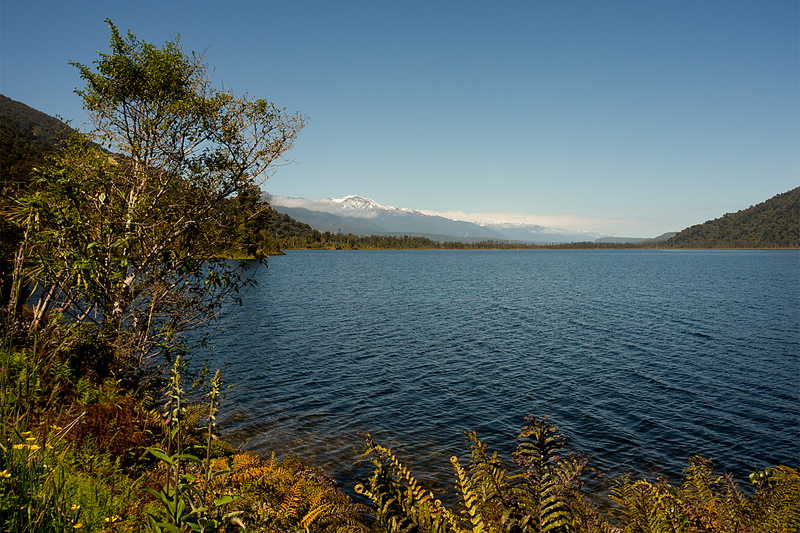 Yes, the Southern Alps are always there, but you only get to see them occasionally. Usually (at least with me seeming to attract moisture from the air wherever I go in NZ), they’re either hiding their heads in low cloud, or are completely obscured by heavy rain. They’re always there, but you definitely wouldn’t always know. 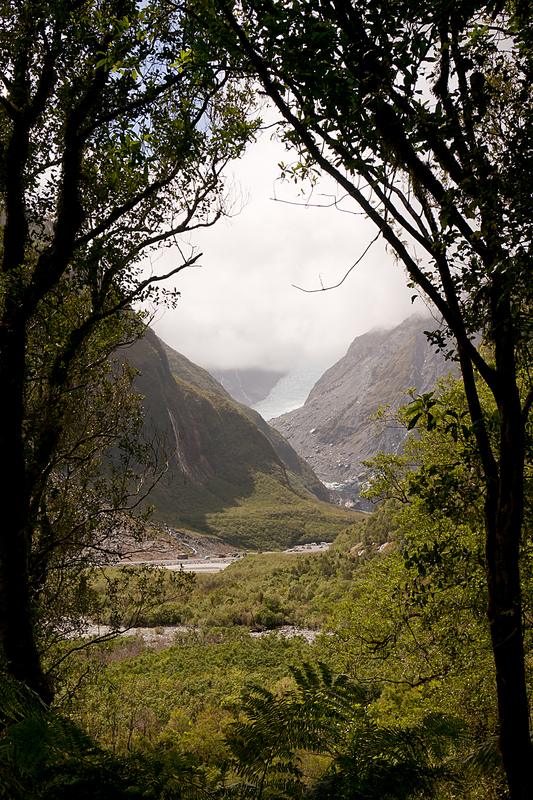 I got to Franz Josef Glacier on Monday. This is both true and slightly misleading, as I only got to the town of Franz Josef Glacier. Not quite to Franz Josef Glacier itself. Hope that’s all clear enough? And then I got soaked on the short, but hilly, run to Fox Glacier yesterday (again, that’s Fox Glacier, not Fox Glacier, but then I guess you’ve worked that out already). This morning (Wednesday), and a now all-too-familiar scene repeated itself. I was, once again, the one in the hostel, watching the hills disappear and reappear between sheets of torrential rain. Given that the nearest hill is only half a kilometre away, it takes some fairly serious precipitation to make it vanish. I was set to push on to Haast today, which is a long day’s ride, and then over the Alps tomorrow to, hopefully, better weather. But the rain’s not ready to let me go just yet. That may be just as well. It would have been a shame to leave glacier country without seeing a glacier. And as the rain became a little more showery around lunchtime, I commandeered a Swede’s car (OK, OK, he was going anyway, and offered me a lift), and we drove up to have a look. The glaciers here come fairly close to sea level, and are surrounded by temperate rainforest. That’s RAINforest. Appropriately enough. Makes a pretty frame for the hills and glaciers, mind you. So, in theory, I should hit the westernmost end of the Kiwi leg of my trip tomorrow, before cutting over the mountains (sounds easy, right? ), and then swinging north toward Christchurch and my flight to Australia. Don’t be too surprised if nothing of the sort happens, though. There are eight of us now. Eight sad, trapped cyclists. The middle-aged Dutch couple with the super-expensive adventure touring bikes. The American lads with their soaked gear. The Anglo-Malawi couple with their matching hire bikes, not yet ridden out of town. The Aussie with the hybrid and the backpack. And me. The place looks like a cyclists’ refugee camp. It’s well over thirty hours now since the rain began in earnest, driving in hard from the sea. It’s ebbed and flowed ever since. And it’s still raining. Sometimes a heavy drizzle, blowing damp into every crevice. Sometimes a full-on monsoon downpour, hammering on the roof and even seeping through the hostel’s old windows. For some of us (like me) it’s wiped out two days’ riding. For others, it’s meant near-drowning before finding shelter here. For all of us, it means we’re stuck in Greymouth for now. Only the cunning old Frenchman escaped, sneaking out to the station at lunchtime to catch a train to better weather (he hopes) over the mountains to the east. 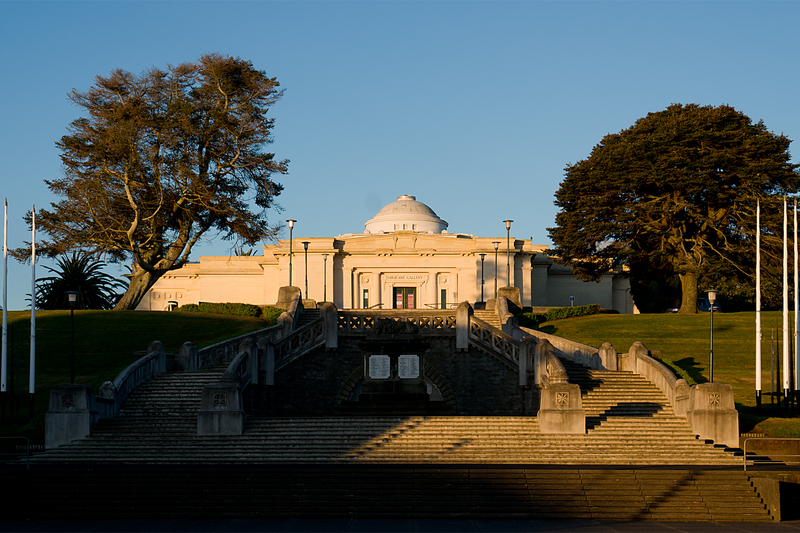 There are malicious rumours circulating that Christchurch is currently basking in 29C sunshine, but nobody wants to think about that. No, the rest of us are doomed. Doomed to gazing wistfully out of the window, sipping hot drinks and imagining slight brightenings in the gloomy sky. Or to wandering aimlessly about town. Or watching the washing spinning in the laundry. Or reading flyers about what we could be doing if the sun was out. The name of the hostel, in which we’re incarcerated, by the way? At least we’re not miners. 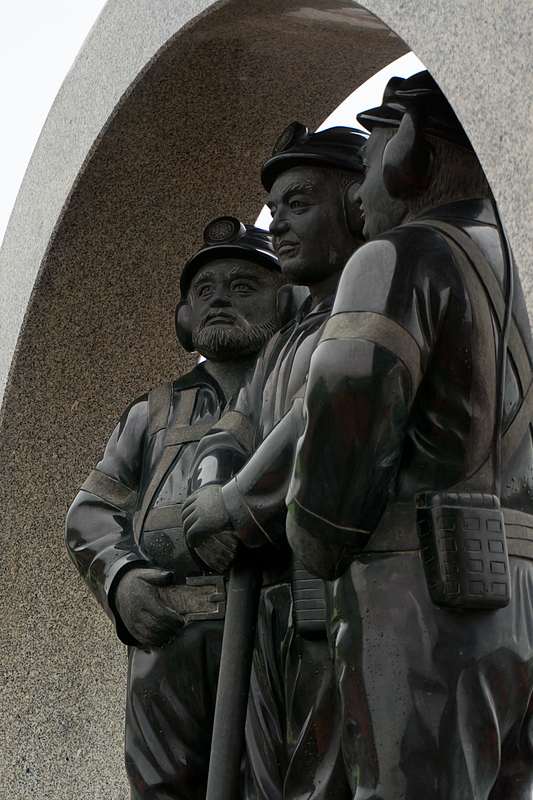 This area was built on mining, and the memorial on the sea-wall in town is a grim reminder of how many died in this area to bring coal and gold out of the ground. We’re not dying here; just bored and frustrated. And things should be better tomorrow (Sunday), with sunshine and showers promised. I got this far from Westport in a day, which is better than nothing. 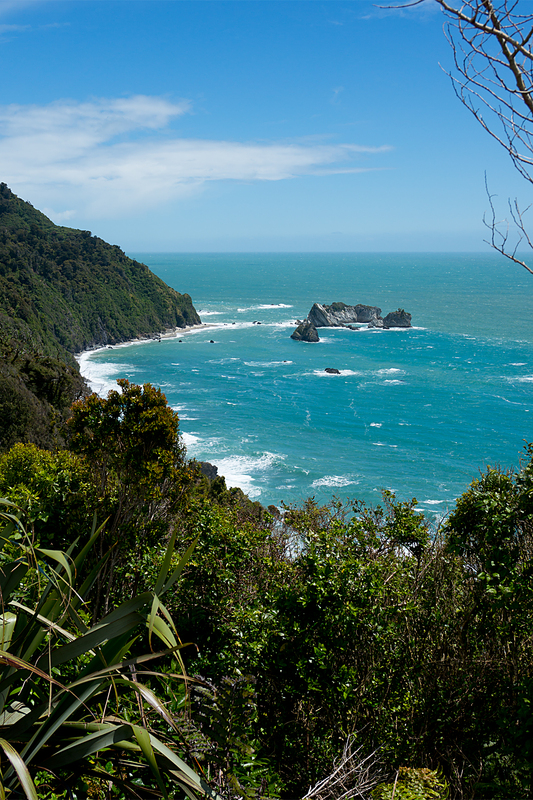 I ignored another woeful weather forecast on Thursday, and lumbered 100km down the beautiful coast highway. I thought I’d only make it about 50km before the rain began, but the rain was late. For once. The road is still a bit lumpy, but it’s allowed to be; it’s a really lovely highway, with some impressive bays and areas of rainforest. And I got to Greymouth dry, which in current circumstances is quite an achievement. I even saw a couple of flashes of blue sky, as I remember. Assuming the rain doesn’t continue for the full forty days and nights (if it does, we’ll have to hope that Noah’s Ark actually floats), there should be a spectacular bomb-burst of brightly-coloured bikers out of town tomorrow. All pushing the pedals with a little extra determination to make up for the frustrations of the last couple of days. It should be quite a sight. It’s raining horizontally in Westport this morning. And while I appreciate the spectacle, I’m not going out on the bike today. Under any circumstances. In fact, I’m writing this from my bed, and have very little inclination to even move from here today. It’s been a really good few days, though, and I’m due a rest. And there’s a bit to catch up on. Leaving Nelson a few days ago, I had an ambitious plan (given the ups, downs and twists of South Island roads and weather) to get to the west coast in two days. The first would be a 130-odd km (80 miles ish) run to Murchison, during which I would tick off both the 8000km and 5000 mile markers for the trip. And this would be followed by a (relatively) easy 100km / 60 mile ride down to Westport on the coast. Simple. As with all my plans, this proved a little optimistic. Unlike most, this one fell apart within five minutes, as I hit the main drag out of Nelson and felt the full force of a brutal headwind. It was immediately clear that there was no way I was going to make 130kms, hills or no hills. I stopped at a shop to fortify myself with cola for a long, miserable day ahead. And almost immediately, another loaded bike tourer appeared like magic (or, perhaps more accurately, like someone who’d been pushing it a bit against the wind to catch me up). It was an Aussie called Ben, who was also heading toward Murchison, but who had sensibly split the ride into two more manageable days via St Arnaud. An extra day, and a few more miles overall, but a complete no-brainer, given the wind. Off we toddled, sharing the usual riding-in-company benefits of a bit of slipstreaming, and a bit of moaning about the weather and Kiwi driving standards. It was a beautiful ride up into the mountains, but still a hard one at over 90kms and well over 1000 vertical metres of climbing. 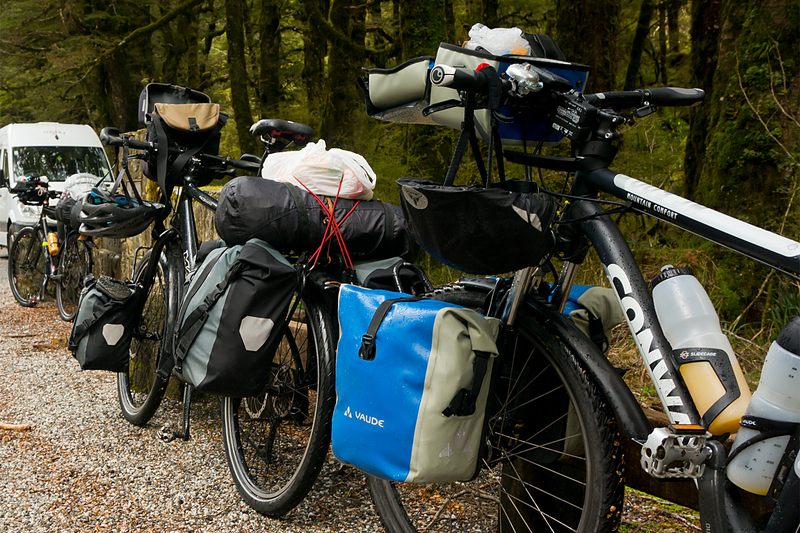 And it turned out that (touring bike geeks that we are), we’d both hit on a very similar threshold for what constitutes a tough day on a heavily loaded touring bike. I’m calling it the Toughness Index. I’ll spare you the immense mathematical complexities involved, and just say that, when applied to all my days on the bike so far, I can now show semi-scientifically that touring New Zealand is tougher than crossing the Rockies (I already knew it felt that way, but it’s nice to be able to prove it). Which also explains neatly why I’m not moving as fast as I was in North America. The less astute reader may think that Ben looks a bit like a girl. A more questioning mind may speculate as to who was taking the picture. It’s possible that some of you may have worked out that we’d met another rider in St Arnaud, and had a small peloton for the day. Oh, and if you really are stuck on who was taking the picture, it was Ben. And he’s not a girl. Obviously. 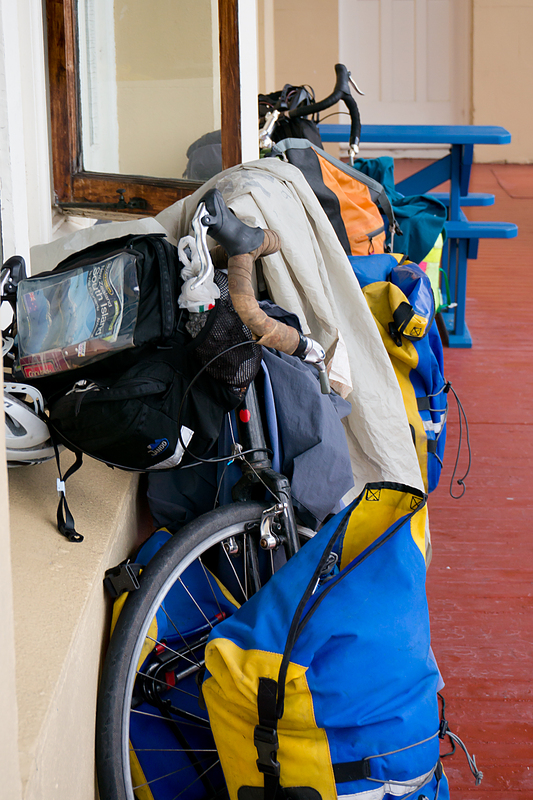 It’s always interesting to see how different people approach bike touring. I’ve got the carefully-designed, super-overbuilt Beast to carry my heavy bags relatively slowly around the globe on a trip I prepared for months. Ben is running a lighter, faster cyclo-cross bike, which probably helps on the hills. Just as well, as he’s a bit of a climbing junkie, heading for the highest and steepest roads he can find in NZ. On purpose. And Sofia (on a gap year from Mexico) basically just bought a hybrid bike and some small panniers in Wellington, tied her backpack on with string, and got on the ferry to explore South Island. Anyway, we had a decent run down to Murchison together, with a very low Toughness Index, and only some properly iffy drivers and a bit of drizzle to contend with. And yesterday morning (Tuesday), Ben and Sofia headed south for more hills, while I finally had Westport and the coast in my sights. 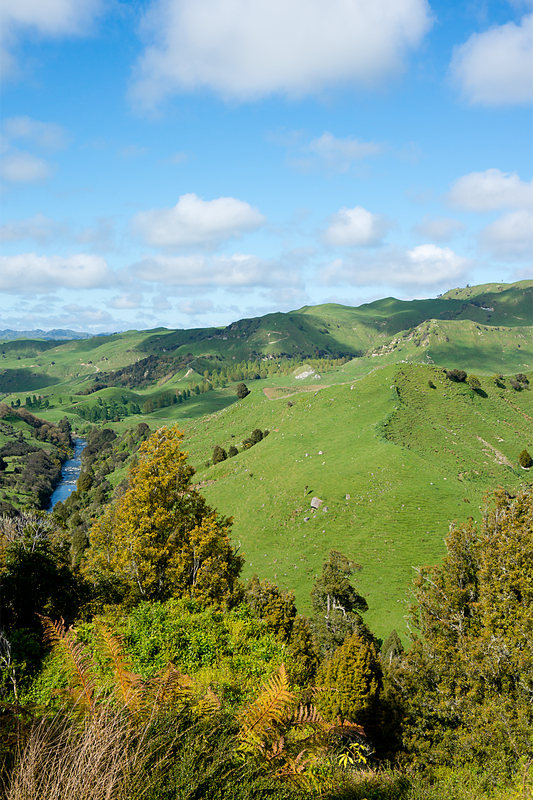 I essentially followed the Buller River valley / gorge all the way to Westport. For once, there was very little rain about (I only spent around half-an hour hiding under trees), and it was a really beautiful ride, watching the river get bigger and bigger as it headed towards the sea. So, once this ridiculous rain subsides, I’ll be off down the west coast. The Toughness Index should drop as I head down the coast, at least for a while. I just hope that the rain (in the wettest part of NZ) and the wind will ease up for a few days, so I can appreciate it properly. The weather forecast is dubious, but then it has been every day here so far. Where is that NZ summer? 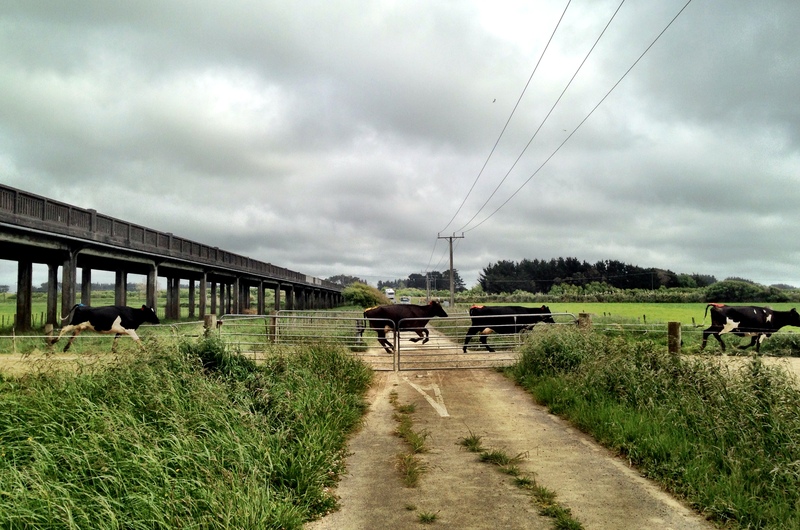 Things took an unexpectedly bovine turn on the way to Wellington. Having hit my antipodal point (so no more geographical gibbering in that particular vein), I got lucky with the weather. A bit of drizzle, but a lovely cross-tailwind pushing me fairly effortlessly down the coastal highway toward the capital at over 100km a day. As I think I might have mentioned before, highway riding can be a bit tedious (between the occasional, traffic-related moments of panic). And as my mind wandered a little, I began to notice the slogans on signs. You know the sort of thing. Where a town or a company pays an ad agency to come up with a few snappy words to capture the essence of what the town or company is about. These are usually either rubbish, or entirely incomprehensible. Or both. American towns seem to specialise in the ‘the best little town until the next little town’, or ‘the home of someone you’ve never heard of’ type of thing. In the UK, it would be even more mundane; ‘Fourth in the County Best In Bloom Competition, 1983’. Companies tend to go for the corporate nonsense approach; ‘Your Innovative Lavatorial Solutioneers’, and that sort of guff. The Kiwis seem to have taken a conscious decision to undermine the whole idea of these slogans. And good on them. There are two approaches that I’ve noticed. The first is the ‘entirely true and obvious’ slogan, which must make marketing companies cry. My favourite of these is NZ Bridges, who have come up with the magnificent slogan ‘We Build Bridges’. That’s a company which has clearly decided that the whole thing is far more trouble than it’s worth. That’s right. Not one, but two cattle-related puns on one sign. 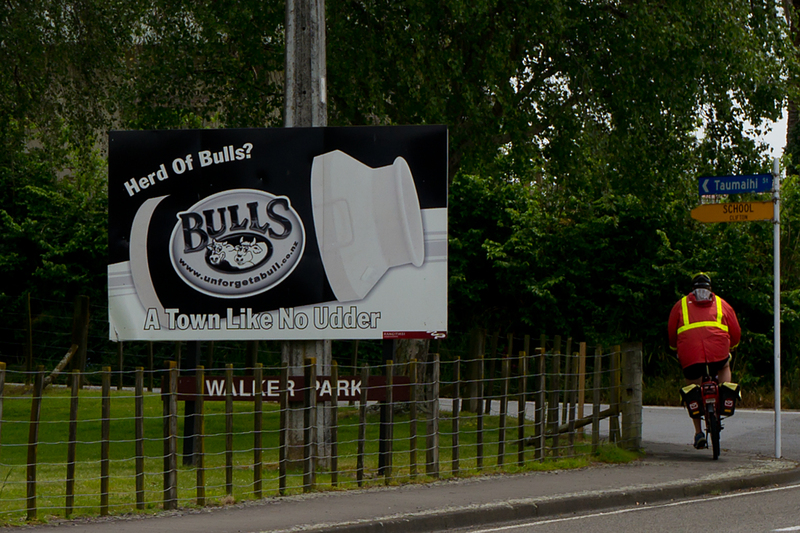 And the town slogan; ‘A Town Like No Udder’. Absolute genius. After so much close-quarters bovine stupidity, it was a relief to roll into Wellington on Tuesday evening, knowing that the North Island was now pretty much behind me, and looking forward to seeing the supposedly gorgeous South. I was given a bed, a feed and a quick night-time tour by Jos, Rocky and family, who very kindly looked after me despite the girls being in the middle of exam season at school. Thanks again, all! Wellington certainly lived up to its reputation for wind. It was still blowing a hoolie after ten at night; everywhere else in NZ, the wind seems to die down after dark. And it was still blustery (though surprisingly sunny) when The Beast and I hopped on the ferry south yesterday lunchtime (Wednesday). I decided to take it easy today, just to get used to the roads in the South, and to work out what a reasonable daily mileage is. The downside of the beautiful hills, bays and roads is that progress is not especially fast. And there are rather a lot of cafes around too. 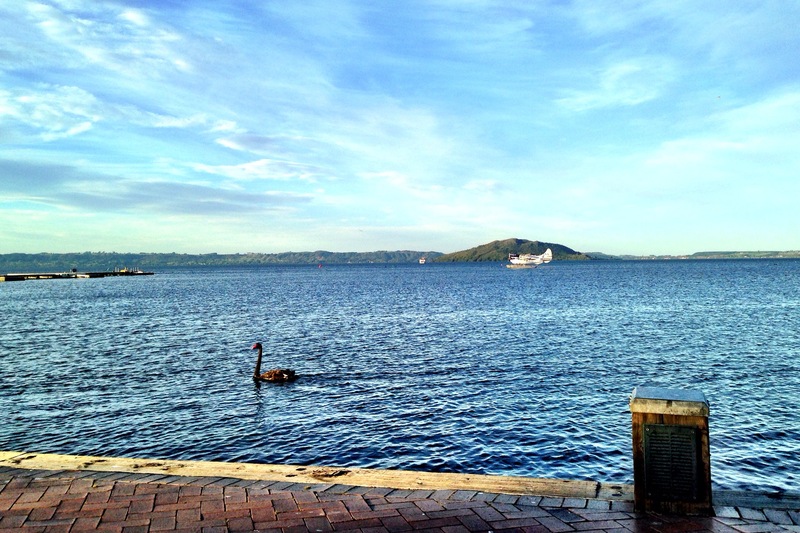 Repeated doses of cake, coffee and beautiful views are not the most efficient cycling combo. But they are all very, very nice. There are, of course, harder days ahead. I’ll be pushing across the hills for a while until things settle down a bit on the west coast. The South Island looks stunning already, so I just need to adjust my riding to suit, hope the showers ease up, and relax and enjoy the ride. It promises to be a good one. You were warned that this was in the pipeline a few days ago. A (fairly short, and relatively painless) geography lesson will follow in a bit. Your options are: to get some coffee so you can pay attention; or to get someone else to read this post for you, and tell you the more interesting parts later. If there are any, of course. First, the straightforward stuff. 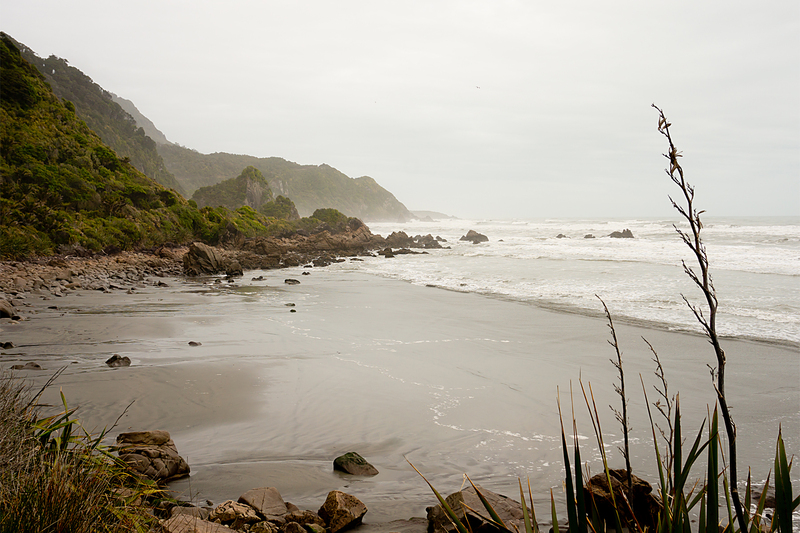 I arrived in the coastal town of Whanganui (or ‘Wanganui’ – I’m not sure what to make of somewhere with two spellings, both of which are used regularly) on Saturday afternoon, dropping off the freezing hills on a chilly, breezy, but entirely dry day. The fact that I’m writing this in a garden, and without a down jacket in sight, is proof that the Kiwi spring weather is giving me a break, for a day or two, at least. After the tough roads and cold (and occasionally very wet) conditions of the higher mountains, Saturday was one of my favourite rides of the trip so far: not too hot, not too cold, not too hilly (though it was a tad steep in places), and mostly downwards (dropping from over 500m to sea-level). I was following Highway 4, which I’d been warned was both busy and immensely ugly in comparison with the smaller, longer and twistier alternative. I’m kind of glad that I didn’t take the option, as it must have been too stunning for words. As it was, the ‘ugly’ road ran through tens of kilometres of beautiful, hilly terrain, reminiscent of never-ending alpine foothills. And with maybe an average of one vehicle per kilometre to worry about. Lovely. 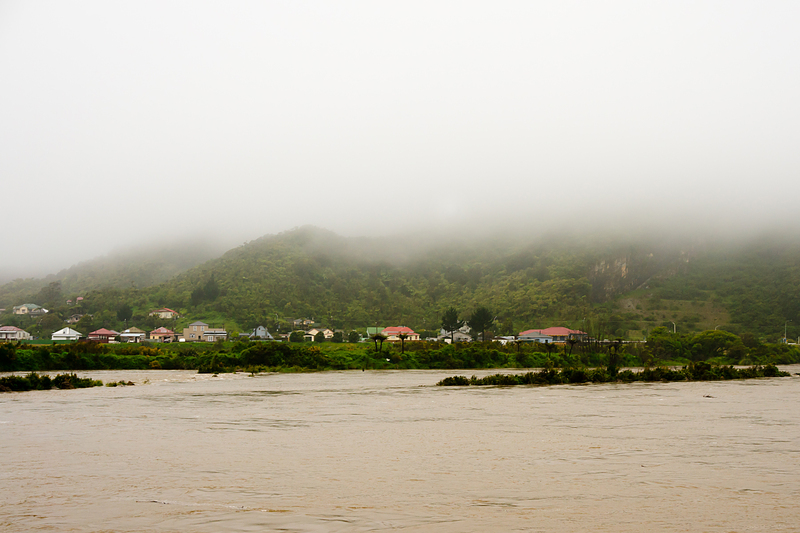 Having dropped all the way to the Whanganui / Wanganui river (first exciting fact; it’s apparently the only navigable river in New Zealand. How much fun is this geography lark, eh? ), The Beast and I stopped for coffee and, naturally, pies, before cruising gently along the riverbank into town. It seems like a really nice little city (even with proper riverside bike paths! ), although the middle is a bit hollowed out, in the same way that many US towns are. Big-box stores and fast food on the outskirts are killing off the proper shops and businesses in the centre, which is a shame, as it’s a really pretty area here. Now, here comes the big geography stuff. Tomorrow (Monday), as I ride out of town on Highway 3, I will ride across the second of my pair of antipodal points. This is, perhaps, not the most riveting nugget of news you’ll receive today, but it is important to me. Why? Well, I’m riding my bike around the world. 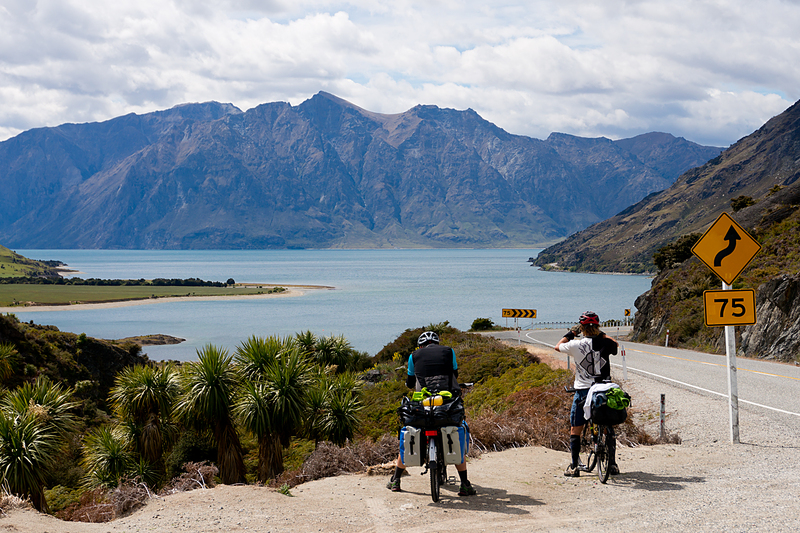 The Guinness records people have defined what a round-the-world bike ride is. Purely for the purposes of rewarding lunatics who are willing to hammer around the globe as quickly as possible in a haze of exhaustion (and exhaust fumes), of course. Since it’s the only set of criteria I can find, I want to make sure that my ride fulfils their requirements, despite the fact that it’s laughably slow in comparison with the speed merchants. The key points of the Guinness criteria are that: the rider and bike must cover at least an equator’s length (24900 miles / about 39800km), including flights etc. ; the minimum distance ridden must be at least 18000 miles (about 29000km); and the route should be ridden through two antipodal points. A pair of antipodal points are a pair of points on exactly the opposite side of the globe from each other. There are a bunch of sites online where you can look up where different parts of the globe match up (as if you give a monkey’s). What’s important is that there are very few places where there is land on both sides of the world, because the oceans are very, very big. For example, the antipodes for the whole of Australia are in the Atlantic Ocean. This makes finding ridable pairs of antipodals tricky. Most ridable pairs have points in Asia (from Vietnam / Laos, up through China and Mongolia), which is all well and good. But the opposite points for these are all in South America (from Peru across into Brazil). Which is unfortunate, as you’ll recall that I’m not going to South America. What’s left? Nothing, except New Zealand, parts of which match up conveniently with Spain. And you’ll also recall that I’ve already crossed Spain. On Day 18 of this little adventure, I found myself (scorching, as I remember) in Talavera de la Reina, about 70 miles west-south-west of Madrid. As I rode west from there, on the N-502, I crossed the A5 motorway. And this junction, as it turns out, would be my first antipodal point. Tomorrow (Monday, Day 120), all being well, I’ll leave Whanganui / Wanganui on Highway 3, and will shortly after be on precisely the opposite side of the world from that Spanish motorway junction. You may be feeling slightly cheated by now, as you come to terms with the crushing realisation that this post is really not going to get any more interesting. I can’t help that; it’s interesting to me. I’m not sure when I started talking to the bike. I mean full-on conversations, rather than just the occasional ‘giddy-up’ on a particularly steep hill. These are not out loud discussions, by the way. I’m not entirely nuts. This seems to happen to a lot of long-range tourers. First you name the bike. Then its little creaks and foibles give it a personality. Then you start to think it’s your friend. Mainly because it doesn’t interrupt or run away when you’re boring it. Then you start to discuss things with it. I hope that we don’t get as far as the obvious next step, which I’m fairly sure is illegal in most places. Anyway, The Beast was pretty convinced that it would snow today. It seems to have settled into the role of depicting the worst-case-scenario, and then gently suggesting that I might rather stay in bed rather than getting frozen / drowned / roasted / whatever else is bothering its paranoid little head. So today it was snow. I ignored its pathetic snivelling, because it’s nearly summer here, and snow would be ridiculous. To be fair, The Beast did have a few legitimate reasons for concern. 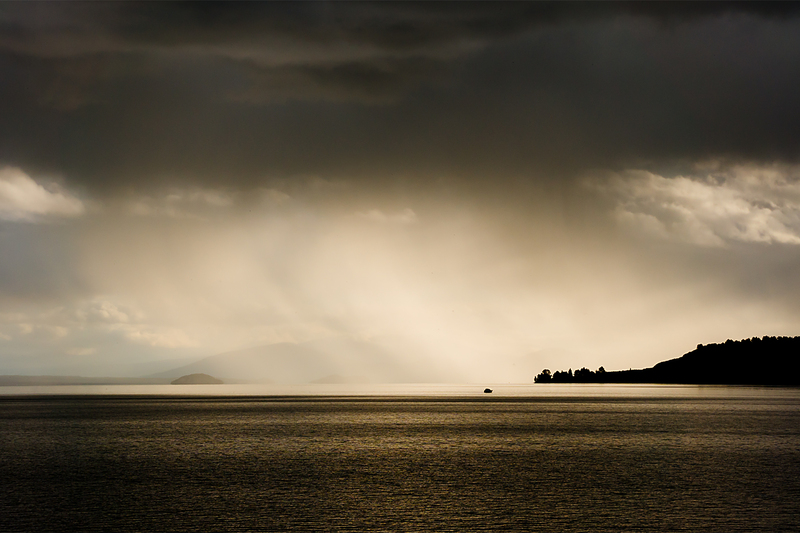 After being stranded in Rotorua for an extra day, I’d set off for Lake Taupo in sunshine, only to spend the rest of the day dodging showers again. Not too many of them, this time, though, and I made good time initially, despite several sausage roll stops and a long chat with Greg, who I met coming the other way. Greg is two-and-a-half years into a long and winding round-the-world excursion, and it was nice to chew the fat for a while. Little did I know that the minutes spent taking to him would cost me an hour hiding under a not especially waterproof tree a few miles out of Taupo, as the showers kicked back in with a vengeance in the afternoon. 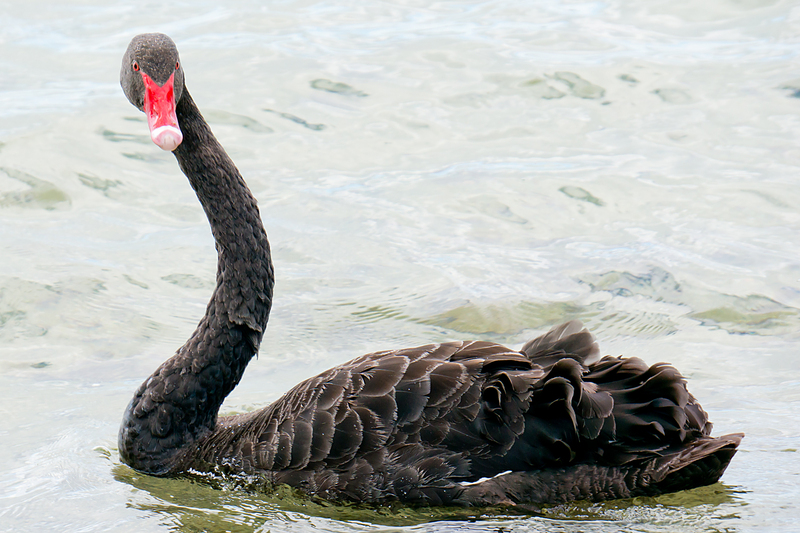 Still, once I was dry in town, I had to admit that they made a spectacular sight, scudding across the lake. And it kept raining continuously until 0730 this morning, when The Beast and I were having our long discussion about snow. Because as the clouds started to rise a little, there was, maybe, a little smudge of white on the hilltops around town. I put it down to The Beast’s fevered imagination. Though it was chilly enough to warrant leg-coverings and full-fingered gloves. Never have I been happier to be carrying winter gear on this trip. 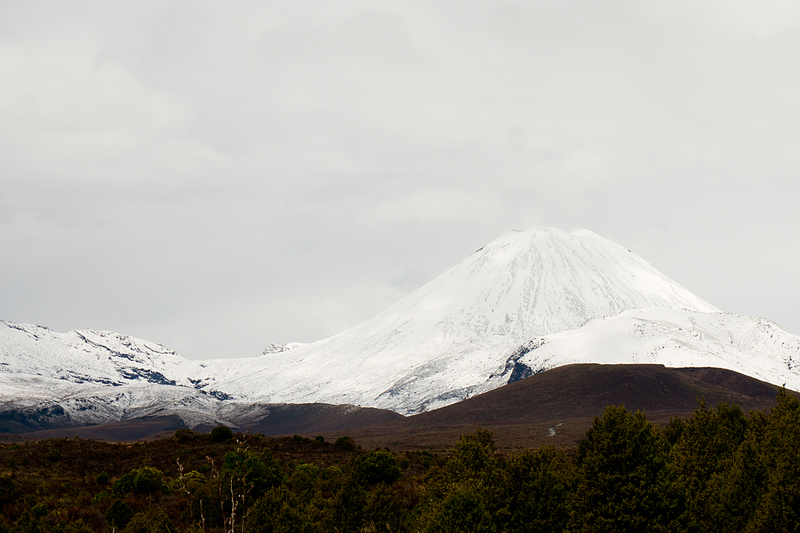 The climb up to the edge of Mounts Tongariro and Ngauruhoe (the second is by far the more impressive mountain – see below – but the area’s famous for Tongariro; probably just because you can pronounce it) was a toughy, and the reward for reaching the top was a (literally and scientifically) gale-force headwind. Which was blasting a random selection of hail, sleet, rain or nothing at me, as well as reducing things to a crawl. Thankfully, I could see most of the showers coming, and I managed to stay reasonably dry until two miles from the end, when I was snuck up on by a mean black cloud, loaded with horizontal rain. Urgh! So, was The Beast right about the snow? Not really; I was always below the snow-line. Was The Beast right about staying in bed rather than riding today? Well, that’s trickier. It wasn’t much fun in places, and I’m not over-enjoying the bitter cold while I’m outdoors (especially after so long in the sun in the US). But it’s all part of the fun. And I’m sitting here now, warm and dry, and expecting to over-rule The Beast again tomorrow and get back out on the road again. It’s really all my own fault. 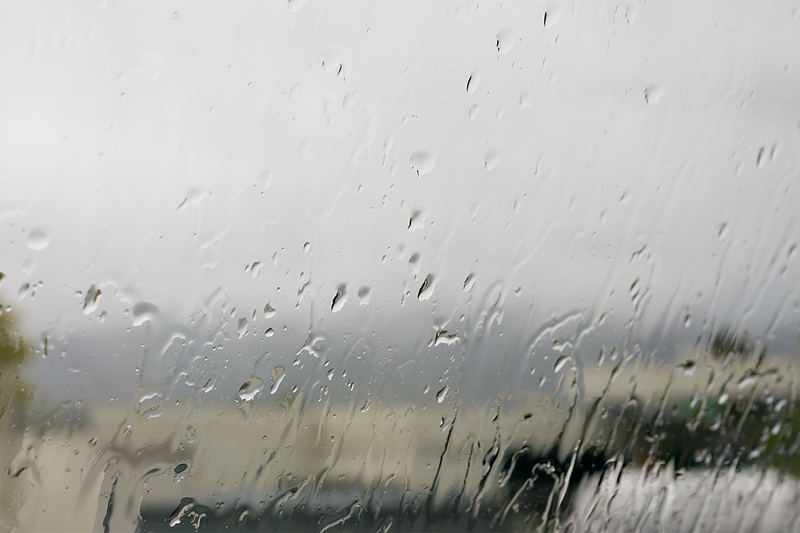 It was bucketing down when I crawled out of my pit this morning, ready to get on the bike and head off to Lake Taupo. And local opinion and the weather forecast agreed that it was going to stay wet all day. I rate local advice. I went back to bed. I’m not in that much of a hurry, anyway. Needless to say, it was dry by half-past eleven, and this afternoon was perfect cycling weather. Doh! Still, tomorrow looks nice (which presumably means hail and thunder by breakfast time), and at least I can fill you in on Rotorua in the meantime. I used my planned rest day yesterday (obviously in dazzling sunshine) to visit Te Puia, which is only a couple of miles out of town. Basically, you stroll out past the pristine racecourse, the famous chip shop, and a thousand motels, and into the charming green countryside. 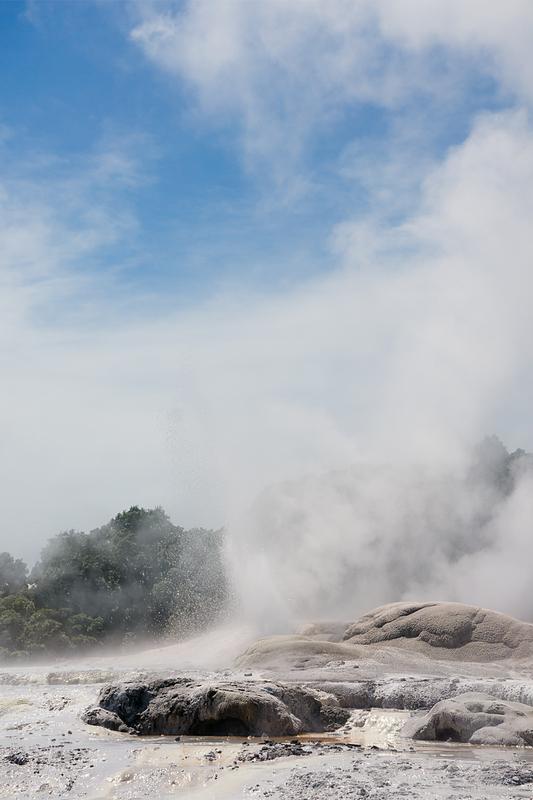 And then you’re suddenly confronted by a huge park full of boiling mud and sulphurous moonscapes. As earlier posts have probably indicated, I’m becoming increasingly frustrated with my uncanny ability to avoid seeing any interesting wildlife (alive, at least; the road-kill count is epic). 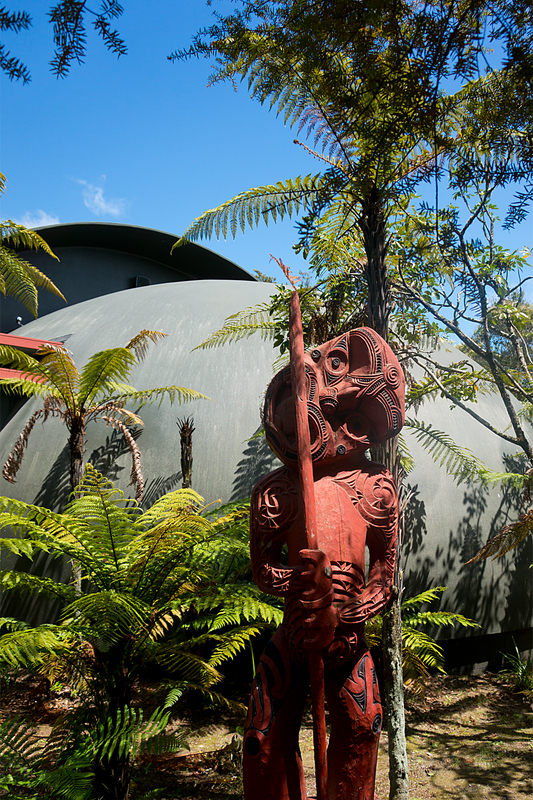 Fortunately, the domed structure behind the statue (below) had an enclosed, and extremely dark, habitat for a Kiwi inside. Even without my wildlife-avoidance skills, I’d struggle to see one of these shy, nocturnal birds. But with one trapped in a concrete dome, even I couldn’t miss. The Kiwi was on a break. I saw some feathers on a grainy CCTV feed from its burrow, and that was it. And no, I don’t know why the statue is eating a stick, either. Assuming the weather forecast for Tuesday is a tad more accurate than today’s, I’m back on the road south. Lake Taupo, then the big hills before Whanganui on the coast, which I need to reach to hit my mandatory pair of antipodal points. I’ll leave the insanely boring explanation of what an antipodal point is, and why a pair is mandatory, for later. 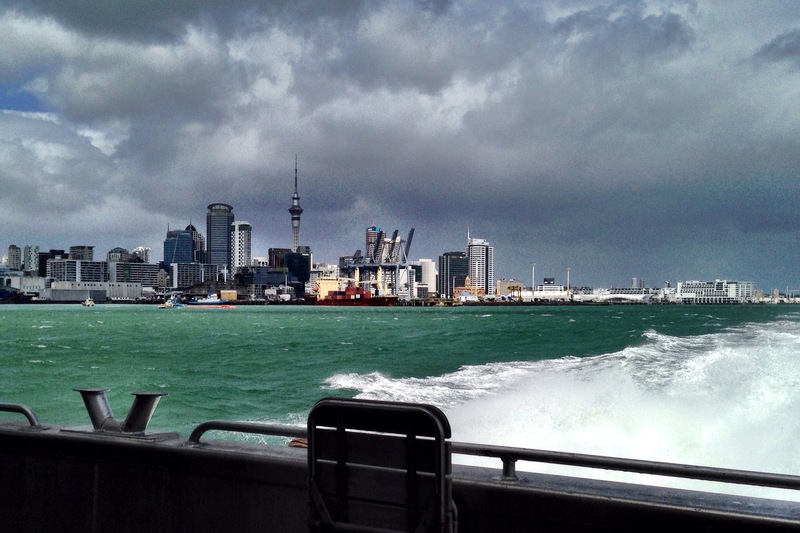 After finally spotting a gap in the never-ending curtains of rain in Auckland, I escaped in a fast boat to avoid the next batch of showers. I’ve been taking my first tentative trundles into New Zealand since. And, apart from the dodgy weather (and let’s face it, as a Brit, I’m not exactly un-used to that), and now two iffy knees, it’s been a delight so far. I’m struggling a little to make sense of how long it takes to get anywhere over here. The roads are sometimes fairly straight and smooth, and sometimes wickedly twisty and steep. So what looks like an easy day’s ride on the map can end up being anywhere between about forty miles (and three hours) and seventy miles (and too tough for a day). I’m even pushing my boundaries to discover the local food. Never was a country more in love with pies. Even the most tired and run-down garage in the smallest village has a warming rack full of them. And a bewildering array. Pastry-topped pies filled with beef, or chicken, or veggies. Or a whole breakfast. Pies topped with mashed potato or sweet potato. Pumpkin pies (maybe Halloween specials). Sweet pies and savoury pies. Fresh pies, and pies that may well have been sitting there since God was a boy. And other pastry-and-meat-related delights like pasties and sausage rolls. I really don’t mind pies. 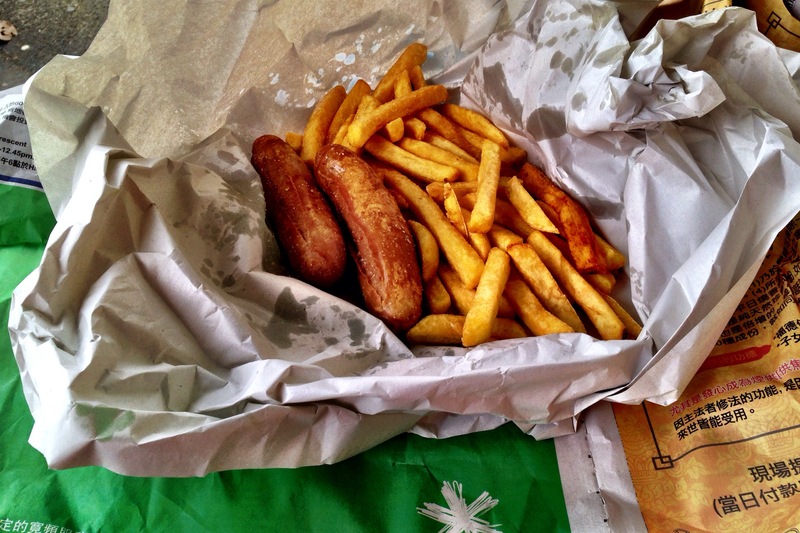 But what I’ve missed is decent, old-school chip shops, and New Zealand has loads of them. And they sometimes still wrap their ‘chups’ in newspaper. Which is so quintessentially British that hardly anyone in the UK does it any more. 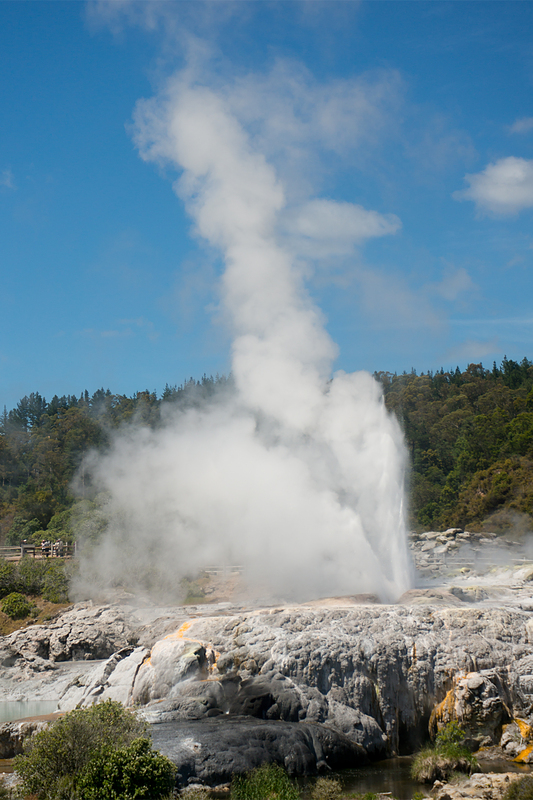 I’ve meandered a little way across North Island, reaching Rotorua this evening. This has meant crossing hobbit country, and, in fact, within just a few miles of ‘Hobbiton’ (film set / tourist attraction). Unfortunately, my luck with exotic wildlife remains unchanged; no bears spotted in the US, and no hobbits, orcs or wizards here. Yet. There’s still time, I suppose, but I don’t hold out much hope. They’re quite elusive, apparently.